1. The movie's title was odd for some. 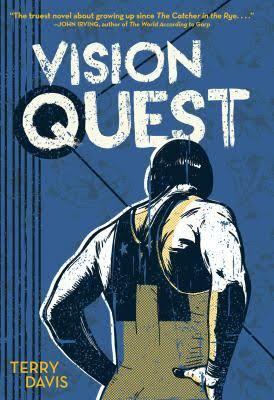 As it's explained in the movie, a vision quest is Native American term for the search for one's purpose in live. In Australia and the UK, the movie was retitled Crazy for You. 2. This was Linda Fiorentino's first feature film and it came on her very first audition. 3. 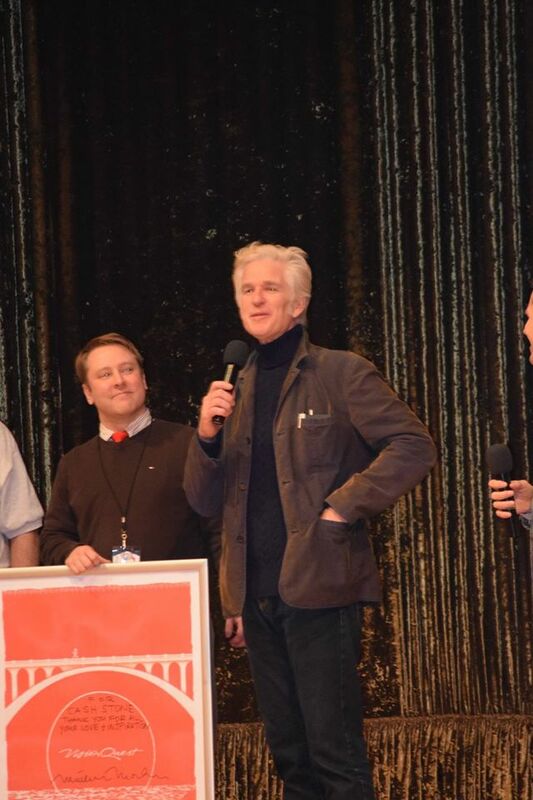 J.C. Quinn, who portrays Louden's friend and the cook in the hotel, would reunite with Modine, this time playing his father in 1989's Gross Anatomy. 4. 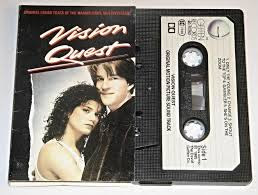 Vision Quest was the third movie appearance for Michael Schoeffling, with his biggest role being Jake in Sixteen Candles the year before. Schoeffling would leave the movie business entirely after 1991. He's believed now to be the owner of a handcrafted furniture business in the Northeast. The opening scene has Louden Swain (Mathew Modine) running across the Monroe Street Bridge in the downtown area near Riverfront Park. You can see remnants of the World’s Fair. The gym where a lot of the wrestling took place was Mead High School, however Rogers HS and Shadle Park HS were also used in the film for wrestling scenes. Louden’s School (Thompson High) was Roger’s HS. It’s where the bus pulled up, as well as where he picked up garbage on the lawn. The hotel Louden worked at was the Ridpath Hotel. The restaurant Louden sees Mr Tanneran dining with Karla is actually the downtown Onion. The restaurant Louden takes Karla to in the beginning is Ferguson’s Cafe in the Garland District, which was also featured in Benny & Joon, staring Johnny Depp. The scene where Louden and Karla go visit Louden’s grandfather on Bigelow Gulch in the Spokane Valley. The white farmhouse shown is still there. The bar Madonna sings in is The Big Foot Tavern in North Spokane. Extra were various locals including college students from Whitworth. The scene in the cafeteria was filmed at Ferris High School, where students were the extras. The scene where Mr Tanneran is shooting baskets has Spokane Community College. The final wrestling scene was also shot there but the double doors he comes through were actually at the college. Spokane HS cheerleaders cheered during matches. Modine was in Spokane 5 months prior to filming to learn how to wrestle from Mead High School’s Cash Stone. Sone turned down the role of the coach due to the profanity used by the coach. Instead he played a referee in the final scene. Ken Pelo, a successful and intense coach from Rogers HS played Shute’s coach. All of wrestling extra were state champions that audition in an open casting call. 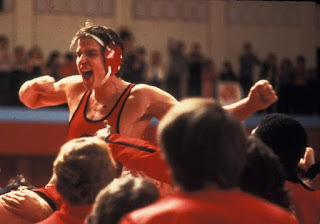 Modine says the success of Rocky mad it possible for sport underdog themed movie like Vision Quest to be filmed. The eating pizza scene in the truck and the final weigh in scene were added as an afterthought. Modine was filming another movie and returned to spokane but had to wear a wig in those scenes due to having a different hairstyle. HERES HOW THE BOOK IS DIFFERS FROM THE MOVIE. • Louden wrestles at 147, not 168. • Thompson High School, which was used in the film, appears to relate more toward Spokane's North Central High School was actually based on Spokane's Shadle Park High School, North Central's rival school, where author Terry Davis graduated from (Shadle's team made a brief appearance as Sherman High School). • In the book, Carla was living with Louden, but for longer than the movie version and was actually settled down with him, living in Spokane. • Gary Shute was the actual name of the character in the book that Louden was going to wrestle (the book ends when their match begins). He was also from Evergreen High School; rather than Hoover High School (which appears in the movie to be based on Mead High School). • In the book, Otto Laft had a much larger role than in the movie. • Elmo, the cook who works with Louden, was a black former boxer, and Gene Tanneran, Louden's English teacher, was white and going out with a cheerleader. In the movie, Tanneran is a black former basketball player, and Elmo is white. • In the book, the mysterious guest at the hotel Louden works in is gay and makes many passes at him. In the movie, he's also gay but is practicing t'ai chi ch'uan. He only makes a pass at Louden once around the beginning of the film while showing him some moves. • In the film, Louden beats Shute in their highly anticipated match. In the book, the story ends as the match is about to begin. "I'll Fall in Love Again"
*The boom mike is visible in the restaurant scene where Louden take to his father about taking Karla in. *In the Louden vs Shute wrestling scene, the ref says “no take down, out of bounds” but Louden in err starts in the bottom position. Theres a scene of Louden and Karla fooling around in the car while Louden was driving. That scene was included in theaters but deleted from the DVD. Me & Mathew 30 years after the 1985 release. A word to describe Mathew Modine is genuine. Truly a nice guy, so generous with his time and appreciative of the author, coach, cast and Spokane. 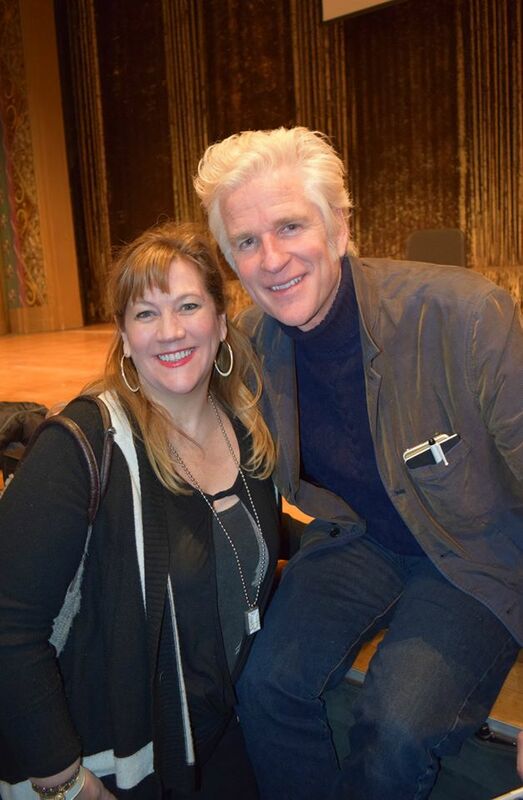 He was sweet and funny and very much like the lovable Louden Swain.